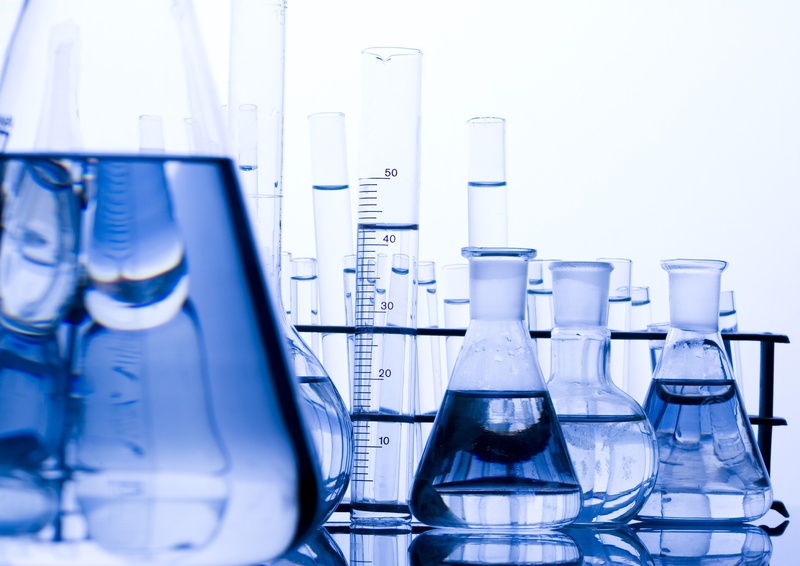 Pure water is critical to the production of a wide variety of products and applications. Water in the pharmaceutical and biotech industries is used as an ingredient as well as for critical cleaning and other process applications. Water is used as an ingredient and is sometimes the product in the food & beverage industry. Several industrial and commercial operations use water as part of their processes or products. Desalination is used when source water in an area has a high level of dissolved solids as the result of salt water intrusion or lack of fresh water. Central water systems in healthcare facilities also use similar systems. The systems used to produce water for this wide variety of industries employ multiple treatment steps, including filtration. Most systems use reverse osmosis (RO) to consistently produce water of high purity. The filters used may include particle removal filters, resin traps, carbon fines removal filters, system prefilters, tank vent filters, and bacteria control filters. Some of these are optional, but all are used in at least some facilities based on policies and conditions. Below are schematics of three extensive treatment systems. The first is an example of a system used in the pharmaceutical industry. This system will generate purified water with the additional step of distillation for producing water for injection (WFI). The second example shows a system that could supply pure water to a variety of other industries like food & beverage manufacturing, chemical processing and even car washes. It uses a reverse osmosis system followed by electrodeionization to remove both dissolved minerals and ions from the water. There are many other examples, but these show the location and function of filters used in high purity process water treatment in a variety of industries. Finally, an ultra-high purity water system like that used in the electronics and semiconductor industry is shown. Ultra-pure water (UPW) is unique because of the very stringent water purity requirements for manufacturing computer chips, flat screen displays, storage media and other high-tech items. Visit our page on electronics/semiconductor water treatment for more information on those systems. Not all steps shown in these systems are required, but they may be found in many industrial systems. Removal of sediment and other suspended particles is critical to the efficient, cost effective operation of any water treatment system. Performed using depth filtration media, particle filters prevent fouling of the initial treatment steps by excess particles. Reverse Osmosis system prefilters preserve RO membrane performance and reduce the frequency of RO membrane cleaning. Trap filters are used after process water passes through treatment equipment like tanks containing activated carbon powder or softening and deionization tanks contain resin beads. These powders or resins may break down, fracture and release small particles. Filters are used to trap the particles and prevent the contamination of downstream treatment process steps. There are many possible bacteria and other organisms that could enter the treatment process, but all can be removed using membrane filters. Organisms can enter the system in a number of ways. One is with the source water, which itself often carries non-pathogenic organisms. System maintenance is another common way that bacteria can enter a system. As equipment is opened to replace parts or clean, the internal parts are exposed to environmental air, allowing the bacteria in the air to enter the system. Bacteria control in pharmaceutical water systems is usually done using heat (maintaining the system at a temperature above 70°C) with additional methods, including filtration, optional. 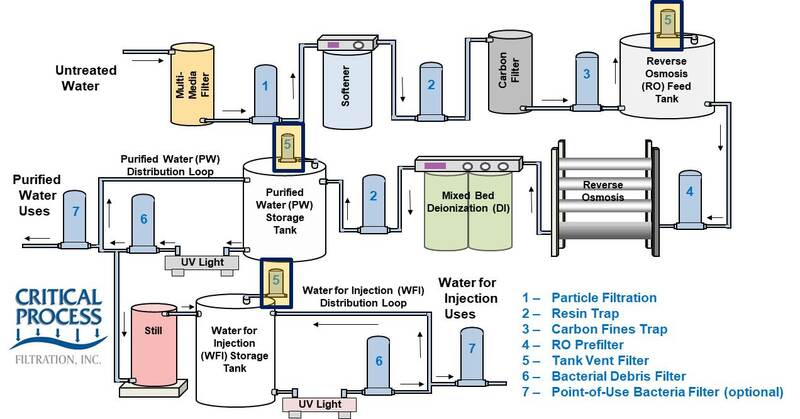 Both diagrams show UV lights followed by filters to remove “bacterial debris” created if bacteria are killed by the lights.Bacteria filters are membrane based with pore sizes of 0.10µm to 0.45µm, depending on the policies of the facility. They will capture most, if not all, of the debris and protect downstream processes. Some facilities may use sterilizing filters as a final insurance against bacterial upsets in the system. If used, these membrane filters most often have pore size ratings of 0.22µm, though some operators choose to use 0.10μm pore size filters. This filter is the most critical in protecting downstream processes from bacterial contamination. To assure that ultrapure water (UPW) in the distribution loop of electronics/semiconductor systems remains pure, Filters C and D are used to remove contaminants that might enter the system or particles that are shed by system components. These filters may be used for bioburden reduction, for sterilizing filtration or for ultrafine particle removal. Membrane filters with pore sizes of 0.10 μm are used as Filter C. Either a tangential flow ultrafilter or 0.03 μm rated dead-end filter are used for filter D. A filter using membrane with a positive charge may be chosen because of its ability to remove organic molecules, including pyrogens that are smaller than the pore size of the membrane. Water may be stored in a tank system for staging before treatment steps or for storage before distribution to points of use. Filtration acts as a critical contamination control step protecting your water from airborne contaminants such as dust, bacteria and mold that might enter the tank with the environmental air that replaces the volume of water pumped out of a tank. Hydrophobic membrane filters are used for this filtration application. Tank vent filters with 0.22µm pore sizes are usually used because of their ability to block bacteria. There are many reasons to remove particles 1 micron or larger in water systems. All are related to protecting processes from contamination by those particles. The particulate matter in water systems could enter with the feed water (municipal or well water). Other sources of particles may be some of the system components such as multi-media filters and resin based treatment components like softeners or deionization beds. There are many filtration options available to remove these particles and protect treatment processes. In most cases, the water entering a reverse osmosis (RO) system is filtered to remove larger particles and prevent premature fouling of the reverse osmosis membranes. The quality of the incoming water determines how much filtration is needed. 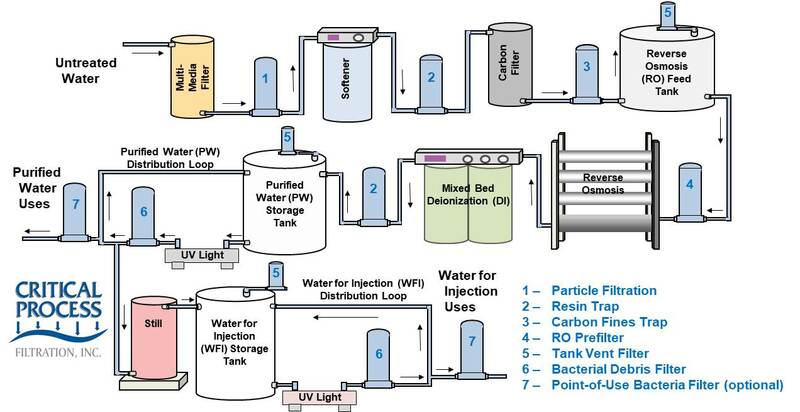 The diagrams above show water systems for treating raw water, including the filters for removing larger particles (highlighted in the diagram). Systems using municipal water will need fewer of the upstream components. Particle filters (housings marked “1”) are located after a multi-media filter (sand filter), which is used in systems drawing water directly from a surface source or well. In most cases, water from municipalities does not require the sand filter. However, if used, the sand filter could release small particles that should be removed before they reach downstream components and clog them or otherwise interfere with their operation. A carbon fines trap (housing “3”) captures fine grains of activated carbon after the activated carbon filter. Activated carbon removes chlorine, chloramine, and other dissolved organic materials from the water supply that can damage RO membranes. However, the carbon granules can break down over time and release small particles into the water that might interfere with downstream processes. The resin-based treatment processes shown are a softener and, in the top diagram, a mixed bed deionizing unit. Removing hardness ions (calcium, magnesium, etc) with a softener helps prevent premature fouling of RO membranes. The deionizer creates deionized water and can make downstream treatment, such as distillation, more efficient. However, the resin beads in both softeners and deionizing beds can break down over time and introduce resin fines into the water. Filters trap the fines and prevent them from harming processes downstream (housings marked “2”). The most important particle filter for the water treatment system is the RO prefilter (housings marked “4” in the diagrams). This filter protects the high pressure RO pump and membranes from premature fouling due to particle overload. Water entering any water treatment system contains bacteria, no matter the source. Even treated, chlorinated municipal water can contain bacteria. While these organisms are generally not harmful to humans (non-pathogenic), they often need to be removed to meet industry water quality standards. The RO treatment process usually removes bacteria from the water. In the pharmaceutical/biotech industry, operators usually maintain the water distribution system at temperatures above 70°C to kill any bacteria that might bypass the RO system and keep the water in a bacteria-free state. In other industries, the energy requirements (and cost) of maintaining a system at high temperatures may not be economical. In those industries, system operators have other options for bacteria control to insure against unlikely bacterial excursions, including using filters in water distribution loops or other locations. Both diagrams below show optional UV lights in the distribution loops to kill stray bacteria. Filters are installed just downstream of the lights to capture the debris created when bacteria are destroyed. Housings marked 6 in the diagrams hold these “bacterial debris” filters. If the UV light is not used, a bacteria control filter may be installed at this location. The filters chosen to remove the debris or bacteria are membrane based with pore sizes of 0.10μm to 0.45μm depending on the level of control the operators think is needed. In most cases, bacteria control filters are used to remove most, but not all, bacteria. The task of removing all bacteria is left to a sterilizing filter, with the bacteria control filter protecting the sterilizing filter from overload if there is an excursion in the system. 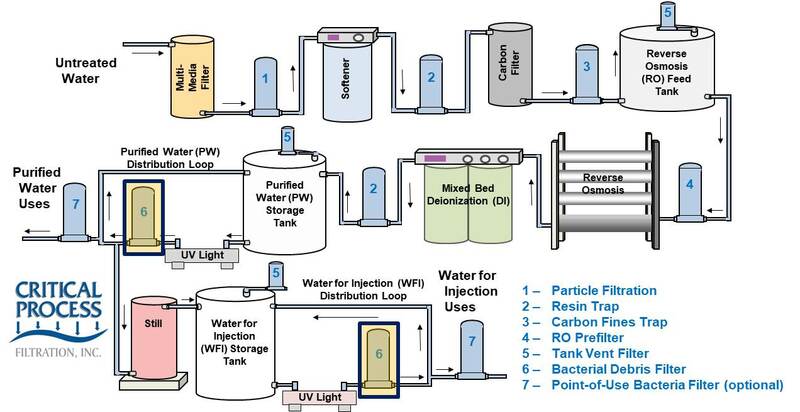 The two diagrams below show simplified processes for creating water for the pharmaceutical/biotech industry and in other industries. 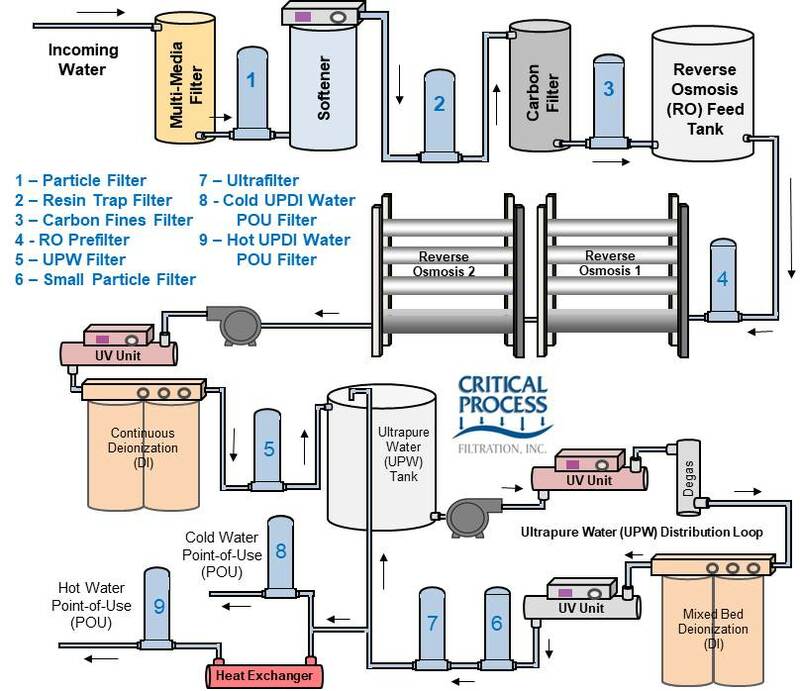 Both system diagrams show an optional filtration step at the point where water is delivered to downstream processes. While the RO is likely to remove bacteria from the water, there is the possibility that faults in membrane assemblies can allow some bacteria to bypass the RO treatment. If the water distribution system is maintained at a temperature above 70°C, as is often done in pharmaceutical/biotech systems, then bacteria that may have bypassed the RO system should be at least deactivated if not destroyed. However, there are some heat resistant organisms that might still live in an elevated temperature system. These organisms are not common in water systems, but some operators want to insure against even the remote chance that they find their way into the water. 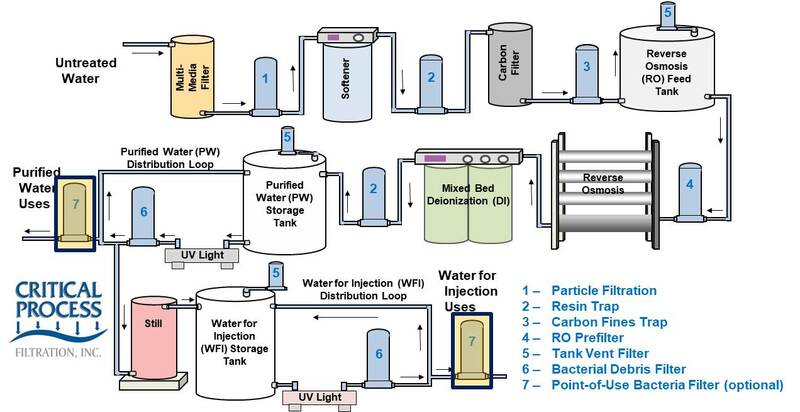 The final insurance against these heat resistant bacteria in pharmaceutical water systems are point-of-use sterilizing filters (housings marked “7” in the top diagram). In industrial systems, the sterilizing filter is shown in the same location, but may actually be moved inside the water distribution loop rather than on a line to a single use location. Placing the filters inside the loop may reduce the total number of filters required in the system, but the location is based on the needs of the specific facility. Because waterborne organisms are often very small, the final filters used to remove them have very small pore sizes – usually 0.10μm to 0.22μm. These membrane based filters may also be made to withstand extended exposure to high temperature operation. Tank vent filters are also critical to the quality of the water. These filters keep bacteria and other contaminants in the environment from entering tanks as they are emptied. The air in manufacturing facilities, even the air in cleanrooms, contains particles and microorganisms, and preventing them from entering the tanks protects water quality. The housings marked “5” in the diagrams are the locations of tank vent filters. In most facilities, hydrophobic 0.22µm membrane filters are used to make sure bacteria are removed from air. The hydrophobic nature of the membrane prevents water droplets from collecting on and wetting the membrane, which would block the flow of air and could lead to tank failure. It is also critical that the filter system be large enough to allow the air to flow without creating a vacuum condition in the tank. Many tanks are not designed for vacuum conditions, so they could collapse if the filter restricts the air flow beyond the tank limits. Check the vacuum rating of the tank when sizing the vent filter system. For tanks used to feed advanced treatment, dust filters may be used. They also must have hydrophobic media to prevent the filter from wetting and blocking air flow.